The Adelphean Society was founded on May 15, 1851 at the Wesleyan Female College in Macon, Georgia. 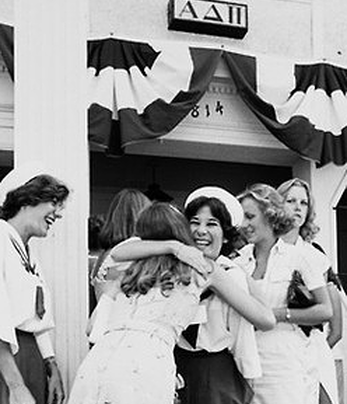 Alpha Delta Pi holds the distinction of being the first secret society in the world for collegiate women. As the mother of sororities, it is only fitting that our founding took place at the first college in the world chartered to grant degrees to women. The qualifications of membership have remained unchanged throughout the years. Alpha Delta Pi was founded on the four principles of scholarship, leadership, service to others, and sisterhood. These four points make up the diamond shaped badge our sisters proudly wear. When UNLV was still called Nevada Southern University, there were a group of girls who called themselves the Phi Delta Chi's. These girls were dependable and were often called upon by the Office of the Dean to help with various activities such as fundraising drives and ushering campus tours. 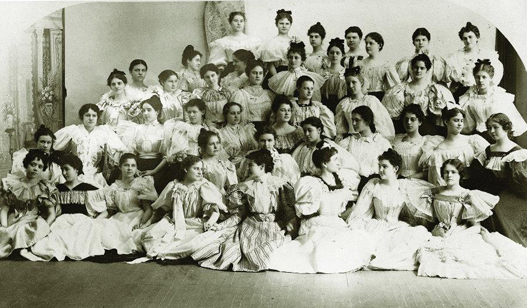 As Phi Delta Chi grew, so did their interest in becoming part of a national sorority. Las Vegas had a large number of active Alpha Delta Pi alumnae who wanted Phi Delta Chi to become the local Alpha Delta Pi chapter. With help from the alumnae, and a great interview with Alpha Delta Pi representatives, the organization officially became a part of the sisterhood of Alpha Delta Pi!